No uplifting thoughts on the importance of a handwritten rejection letter, no pious sermons on how rejection is good for the soul. Truth #2: You are going to be rejected. 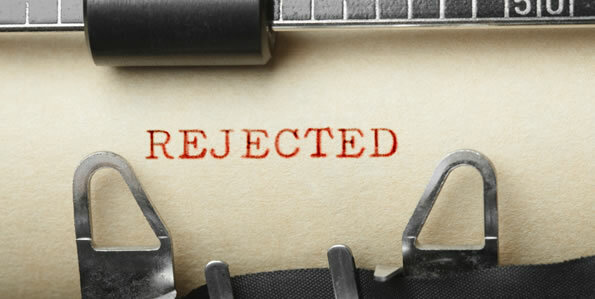 Rejection, unfortunately, is the flip side of writing for publication. Only writers who write solely for pleasure and consign each of their efforts to the lower left-hand desk drawer can manage to avoid rejection. If that description fits you, congratulations. You’re a lucky person. You’ll never know how awful it feels to be rejected. And you’ll never know how wonderful it feels to be accepted. Rejection is part of the game and, if you’re going to play, you’d better get used to it quickly or your career will be short-lived. Tough words? Yes. But, then, this is a tough business. Now, I’m not saying you should keep a stiff upper lip and celebrate each rejection, or thank an editor for scrawling “no” in red ink on the cover page of your manuscript. As a matter of fact, if you feel like exercising your vocabulary of four letter words or going on a 24 hour chocolate chip cookie jag, this is the time to do it. Vent your anger and your pain and your frustration. Tell your husband that the editor who just rejected you got her degree from the Ultissima School of Beauty. Tell your best friend you plan to turn your computer into a planter. Tell your cat you’d find more satisfaction in frying fish sandwiches at the local McDonald’s. Get it all out of your system in the privacy of your home and then, the very next day, get that manuscript back in the mail and get yourself back to work. Take time to learn how to minimize your chances of rejection. Learn your markets and review them every few months. Polish your material. Send out clean, crisp manuscripts that look as untouched as a 1960s Harlequin heroine. When you’ve exhausted the whole circuit of possibilities, reevaluate the manuscript. Is it outdated? Weak? Have a number of books with similar plot lines appeared lately? If so, retire the manuscript with an eye toward possible revamping in the future. Be realistic. Writing a bestseller requires hard work; marketing one requires even more. Don’t expect to hit paydirt quickly. It may take twenty rejections (or more) before a publisher makes an offer. A writing teacher of mine had a short story he believed in, and he wanted to sell it to a prestigious literary magazine. The prestigious literary magazine, however, had other ideas and rejected his story its first time out. My teacher,however, was a professional. He swallowed his wounded pride and sent his story out again. And sent it out yet again. By the time he’d garnered 22 rejections, the editorial staff at the prestigious literary magazine had changed and he sent the story back. And they rejected it again. Stalwart writer that he is, my teacher continued to study his markets and kept his story circulating. After its 41st rejection, the staff of the prestigious literary magazine once again changed hands. My teacher, ever a man to recognize an opportunity, fired his story back out them and, lo and behold, on its 42nd try, his short story was accepted. My stories of rejection may not be as dramatic as my writing teacher’s, but they do serve to point out the power of perseverance. Back when I was doing my share of short stories and articles, I received a rejection letter scrawled in eyebrow pencil on one sheet of Charmin: a simple, powerful NO that even now, years later, is enough to make me cringe with embarrassment. One less-than-kind editor suggested I take my stories back to Bambi and the Disneyland forest where they belonged. I became so adept at fielding rejection that I didn’t recognize encouragement when it came my way in the form of a letter from Nancy Coffey, who was then with Avon. Thank you so much for sending your proposal to Avon. At your convenience, please send the complete manuscript. Nice letter, I thought. Everyone probably gets a nice letter like that. As I said before, this is a tough business and it’s especially tough when you’re trying to get your foot in the door. I’m lucky enough to be published, so it’s not terribly admirable when I pick myself up after a setback. I can turn around and look at my book covers–all nicely framed and hanging on the wall near my desk–and remind myself that I’ve done it before and will do it again, no matter how hard that is to believe at the moment. The people I most admire are the ones who are dedicated enough to keep at it against the odds. Granted, it helps to be a little crazy, for who in his or her right mind would work three months or six months or a whole year on a project that comes with no guarantee of success, no union protection, no job security? Only a true writer, like my friend Sally, would ever be that crazy–or that dedicated to a dream. My manuscript came back today. Instead of Dear John letters, I get Dear Sally letters! I’m not sure if reading it and realizing that once again I’d failed to impress an editor hurt most or realizing that it was written and mailed on my birthday–contrary to that day’s horoscope declaring that a “lucrative contract could be in the making…” I guess, if anything, I’ve learned to not read horoscopes! It’s nights like these when I wonder how many more rounds I can go. When I first read the rejection, I decided, “That’s it! I’m not working any further on the manuscript.” Maybe my first reaction was the right one. Today’s horoscope reads, “Plans subject to change–keep options open, define terms, refuse to be discouraged by one who lacks faith…” Not bad, huh? I’m in high gear this morning. Mostly I just feel stubborn–I feel a real determination to sell my story. I’m still very reluctant to pack it away and wonder if, in doing so, I won’t have lost my best opportunity. These are morning-coffee thoughts — H just called and we hashed over the manuscript again. I’ve a different slant on it and I’m diving in once more. This time I think I’ll make it. And she did. Three years later, Sally sold two books to a major publisher. Looking back on my checkered business past, I can’t dispute that statement. Writers write. We can’t help ourselves. The disease is in our blood and in our bone and it colors the way we view ourselves and the world around us. If you’re truly a writer, rejection won’t stop you, for if you want success badly enough, you’ll persist and, ultimately, you’ll triumph. Even if it is on your 42nd try! I REALY LOVE YOUR BOOK AND HAVE READ 49 IN THE LAST MONTH ESP. THE ONE WITH OCCULT THINS IN THEM.